Louise L. Lundquist, born February 11, 1932, passed away on July 16, 2017 at her home in Mesa, Arizona. She is formally of Lakeville, Minnesota and Two Harbors, Minnesota. She is survived by her husband, Gordon; her son, Mike Halter, and his wife, Mary, of Two Harbors, Minnesota; granddaughters, Michelle Halter and Melissa Halter, of Duluth Minnesota; great grandchildren, Brea and Lexi, also of Duluth; brother, Darold Mammenga, and his wife, Joyce, of Hibbing, Minnesota; and numerous nieces, nephews and cousins. 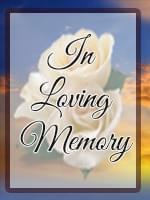 Offer Condolence for the family of Lundquist, Louise L.